This course of study is ideal for public works professionals looking to assume positions of greater responsibility. 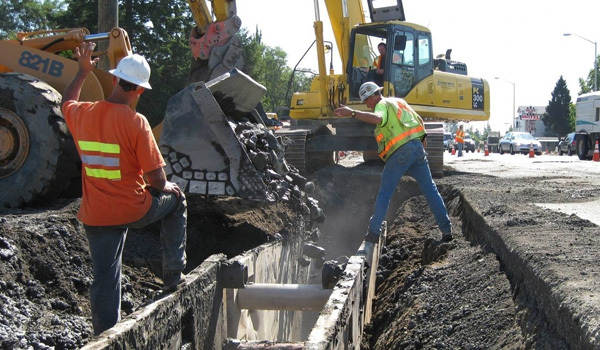 The concentration, offered through our online diploma program, provides public works professionals with the specialized knowledge to make tangible differences in their organizations and in the quality of life of their communities. This diploma program is conveniently delivered in an online format, meaning you can earn your diploma and complete all coursework from your own home with minimal disruption to your personal or professional life. As writing and comprehension skills are fundamental to any supervisory or leadership position, the program begins by ensuring that students have a reasonable capability in this area. The Public Works Manager reports to the Director of Operations. This position manages, supervises and coordinates the activities and operations of Water, Wastewater and Infrastructure within the Public Works Department. Assume management responsibilities for assigned services and activities of the Water, Wastewater and Infrastructure. Manage the policies, procedures and priorities for Public Works. Plan, direct, coordinate and review the work plan for staff; assign work activities, projects and programs; review and evaluate work products, methods and procedures; meet with staff to identify and resolve problems. Select, train, motivate and evaluate staff; work with employees to correct deficiencies; aide in discipline and disciplinary procedures. Oversee and participate in the development and administration of the division’s annual budget; participate in the forecast of funds needed for staffing, equipment, materials and supplies; monitor ad approve expenditures; implement adjustments. Serve on committees to enrich the community and the members. Prepare and present reports and other necessary correspondence. Provide assistance to the director in all aspects related to Public Works; recommend revisions to programs, policies and procedures where applicable. Respond to, and resolve difficult and sensitive citizen inquiries and complaints. Maintain records for all band equipment and maintenance schedules. Follow and meet all INAC, CIAS/ACRS reporting requirements. Manage each infrastructure area and coordinate maintenance, road, water, sanitation and community buildings. Stresses the importance of job site safety and identifies the project manager’s duties and responsibilities regarding safety. Covers loss prevention and creating a zero-accident work environment. Presents several checklists as references. Introduces trainees to the knowledge and skills required for team leadership. Covers practical information about today’s construction industry; basic leadership skills; safety responsibilities of a supervisor; and a detailed survey of project control techniques. While this module has been designed to assist the recently promoted crew leader, it is benefi cial for anyone in management. The course covers basic leadership skills and explains different leadership styles, communication, delegating, and problem solving. Job-site safety and the crew leader’s role in safety are also discussed. This edition goes into detail on project planning, scheduling, and estimating with new performance tasks to assist the learning process. Introduces the role and responsibilities of project management, including technical and management skills and an overview of the phases in a construction project. Describes alternate project delivery methods. Discusses the values and expectations of the workforce, building relationships, and satisfying stakeholders. Describes the principles of effective communication, applying the management grid, and using relationship skills to create a leadership environment. Also discusses behavioral interviewing and professional development of personnel. Describes the key elements of successful negotiations and negotiating techniques. Discusses how to recognize nonverbal signals, use negotiating tools, and apply conflict resolution strategies. Identifies symptoms and barriers to solving project-related problems and applying problem-solving techniques, brainstorming, and identifying root cause consequences. Contains information and instructions for setting up, running, recording, and closing a horizontal traverse and a level loop. Also covers primary and secondary control plans, as well as vertical control for multilevel structures. Contains information and instructions for gathering, recording, and plotting profile and cross-section leveling data. Includes plot and site plans to identify rights-of-way, utilities, setbacks, boundaries, and tie-in locations. Emphasizes the importance of documentation and explains the types of documents, drawings, and specifications used on a project. Explains methods of obtaining work in the industry and types of contracts and insurance requirements. Describes the change order process and the documents required to close out a project. Discusses the importance of formal job planning and creating a performance-based work environment. Discusses the Work Breakdown Structure (WBS) as the foundation that identifies deliverables, tasks, and time. Introduces the basics of quality control and defines the roles and responsibilities of an effective team and how to allocate resources. Emphasizes the importance of accurate estimating and summarizes the estimating process and the steps in developing an estimate. Defines the purpose of a cost control methodology, explains how to perform simple cost analysis, and covers the project manager’s role in controlling cost and tracking rework cost. Defines quality control and quality assurance, and stresses management’s concerns about quality. Explains project quality management and how to develop an effective quality control plan. Discusses how to identify, assess, and measure weaknesses to avoid rework. Describes the project manager’s role in creating a culture of continuous improvement. Explains the fundamentals of a continuous improvement program and how to identify the critical problems and processes that require improvement, implement a continuous improvement process, and measure results. Emphasizes the importance of satisfying internal and external stakeholders. Provides an introduction to using and maintaining document control. Defines the elements of material, labor, and equipment estimates and how to develop, organize, and look for errors in an estimate. Discusses the hazards and safeguards associated with the use of aerial lifts, ladders, and scaffolding. Describes how to safely set up and use this equipment. Explains how to identify, avoid, and react to unsafe conditions when working from elevations. Covers the selection and use of appropriate fall-protection equipment. Participants learn how to recognize the hazards, employ the safeguards, and avoid and respond to accidents and injuries related to walking and working surfaces. Covers the chemical and physical properties of concrete and the components, such as cement, aggregates, and admixtures, that make up the concrete mixture. Explains the various methods and equipment used to sample, test, and inspect concrete. Minimizing hazardous-waste production and preventing water and soil contamination are covered in this module. Participants learn about the training and medical surveillance requirements for personnel working with materials such as hazardous waste, lead, asbestos, and silica. Also covered are the primary types of environmental problems and the hazardous-waste shipping requirements common on a construction site. Covers the setup, use, calibration, and care of electronic distance measuring instruments and total stations.